AMD DX11 Cards To Support 6 Monitors As A Single Display | OhGizmo! By Chris Scott Barr on 09/11/09 • Leave a comment! When most people walk into my office, the first thing they notice is that I have a lot of monitors at my desk. Two of them are for my Mac, and two for my PC. However, I’ve always thought it would be cool to have more. I’m sure you’ve all seen movies where some hacker has six ore more monitors arranged in a nice rectangle. That’s exactly what I want, and it seems that with AMD’s new DirectX11 cards, I’ll be able to do this. Now I’m sure you’ll point out that I can hook up plenty of monitors to my Windows machine just fine. That’s true, I’ve had up to four connected at once, but it does not provide the desired effect. When I launch a game, it still only plays on a single window. 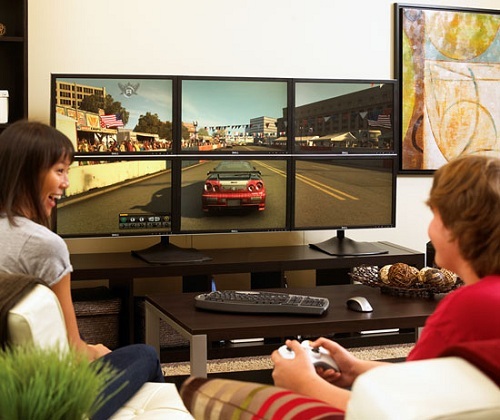 However, with AMD’s Eyefinity tool, Windows will think that all of the connected monitors (up to 6) are really just one large display. That’s right, you can have six monitors arranged in a rectangle, and when you fire up your favorite game, it will show up on all six. Of course you’ll probably have some fun in getting the game to work at the proper resolution, depending on the title. The bezels will also be a little annoying, but AMD is working with Samsung to create monitors with extra-thin bezels for this sort of purpose. I can’t wait to get my hands on one of these cards and try this out myself. Unfortunately it sounds like you’ll need to have at least one monitor hooked up using a DisplayPort, meaning you can’t just go grab a bunch of old 17-inch monitors and go to town. Still, count me in.